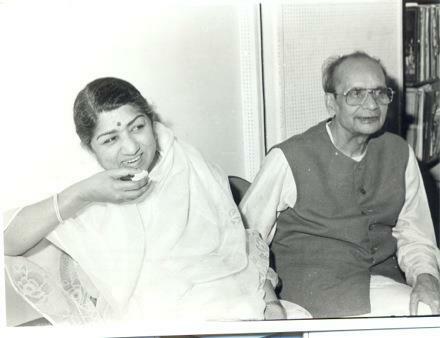 The 1999 RMIM meet commemorative was a tribute to Lata Mangeshkar on the ocassion of her 70th birthday. One of the songs in the compilation was Sudhir Phadke’s duet with Lata “kismat ka nahiindosh baanvare”. Vish Krishnan, in his commentary mentioned the list of albums in which they partnered “Murliwala, Maltimadhav, Gokul Ka Chor, Pehli Tarikh, Ratnagahar, Sajni and Bhabhi Ki Chudiyan”. Songs like “baandh preeti phuul Dore”, “jaa re chandr” were being discussed on RMIM around that time. That was how my fascination for Babuji began and I started looking around for more of his songs. An year later I found a job in Chicago. Those were the days when I had just learned driving but was a little scared to drive on the highways. Dr. Arunabha Roy had invited me over to his place, and promised to give me a tape of rare Lata songs. So I gathered a little courage and ventured onto I-90 and went to University of Chicago. Arunabha revealed that the tape he was referring to was a compilation of Suhdir Phadke songs that Dr. Mandar Bichu graciously shared it with him. The compilation was an instant hit and I just fell in love with the melodies. I just cudn’t get some of the songs out of my head and ended up posting the lyrics on RMIM. The song selected today is among that special set. The opening line “raat andhiyaari hai” sets the tone for this melancholy nocturne.Lata emphasies “raat” and “andhiyaari” as if the night is very long and very dark. sukh se tuu so mere praaN, mere maaN, mere rain ke vihaaN .The song oozes maternal love which is epitomised by the line sukh se tuu so mere praaN, mere maaN, mere rain ke vihaaN Every time praaN, maaN or vihaan are rendered, the emotion is so perfectly captured that one can visualise the the love showered by the mother on her child . The other recurring emotion in the song is sadness. In the second antara the word “andhkaar” is repeated to cascading effect taking darkness to new heights. Pandit Narendra Sharma’s lyrics are a constant with Sudhir Phadke’s music and the following line takes the cake for me. aa.Nsuuo.n ke motiyo.n kii tuu hai musakaan The orchestration is soft, subtle and soothing. It complements the theme very well and elevates the song to a treasure that can be cherished for a lifetime. February 28, 2013 marks the birth centenary of noted poet and lyricist Pt. Narendra Sharma.On this occasion, Lavanya Shah, Pandit ji’s daughter shares with us some facts and personal memories of her illustrious father. Thanks, Lavanya ji. Like a child that climbs out of the womb of Earth and stands in awe witnessing the glorious golden Sun rays, sparkling on the highest peak of majestic Everest and remains transfixed that is the feeling flooding my tiny heart as I sit and write and remember my father, late poet Pandit Narendra Sharma. His contribution is immense. It is spread over six decades on all the modern mass media communication avenues like Books, Films, Radio, Television and now the World Wide Web via YouTube, Facebook, etc. remains life -giving, illuminating SUN energizing and inspiring me in spite of life’s pitfalls. I hope, his immortal poems and songs will inspires us all today and forever. So, I dedicate the song ‘ Jyoti – Kalash Chalke’ in his fond memory. We all know him for his Hindi songs but he was also an expert astrologer, Ayurvedic healer, as well as human encyclopedia on Indian History, Culture and Philosophy. Many children were given unique names like Vihaan (Dawn), Yuti (Union), Lavanya (Grace = me :), Kunjam (Cuckoo), Sopan (chapter or ascent = My Son). Some rare names given by him include Vividh – Bharti, Manjusha, Bela Ke Phool, Hawa Mahal , Gajra, etc. for AIR , the name Dilip Kumar to Yusuf Khan & NAVKETAN for Dev Anand’s Film Production company. A gifted child, ‘Narendra‘ was born on February 28th,1913 in village Jahangirpur, Tehsil Khurja of district Bulandshahar U.P. in a Bharadwaj Brahmin family. He lost his father Purna Lal Sharma when he was merely 4 years old and was raised lovingly by Uncle Ganpat Tau ji & Ma Ganga Devi. A child prodigy, Narendra named thus by an uncle (a fan of Tagore) entered straight into class 7 th and was a top student in his class and favorite of Teachers. Passing Intermediate from Khurja, he joined Allahabad university and did his Masters in English Literature & Education. The Sangam city of Allahabad introduced the budding poet to giants of Hindi literature like Niralaji , Mahadevi, Pant, Bachchan, Kedar Nath , Shamsher & many others. Narendra’s book of poems ‘Shool – Phool’ was released at age 20. With tuitions and editorial duties (he was sub-editor of Abhyudaya Hindi Daily Newspaper) he completed his studies. After graduating, he taught English & Hindi poetry at Benaras Hindu University. Then he joined the All India Congress Committee at Allahabad as Hindi Secretary to Pandit Jawaharlal Nehru and later as Hindi Adhikari in Feb 1955. Narendra Sharma’s poems written in his youth, depicting love and longing and splendour of Nature steadily turned patriotic as India reached its tryst with Destiny. During AICC work he was imprisoned on direct ordinance of Viceroy and jailed without trial by the British. The patriot had august company of Menon, Kriplani, etc in Devli Detention Camp, and Rajasthan & Pune Jails. He did fast unto Death for 14 days and was force fed in order to keep him alive and released early. Mother Ganga Devi remained hungry for 1 week and awaited her son’s arrival at home. away with him to the film city of Bombay to join Bombay Talkies under Devika Rani. Thus began the journey of a young man born near the Ganga to go towards the Arabian Sea where destiny introduced him to Susheela Godiwala, his wife to be from a Gujrati family. They got married on May 12th 1947. Their home at Shivaji park Matunga was a hub of artistic and creative activity with the likes of Panna Lal Ghosh, Pant, Anil Biswas, Dr Safdar Aah Sitapuri, Ramand Sagar, Chetan Anand, Vijay Anand, Dilip Kumar , Amrit Lal Nagar etc as regular guests. MS Subbulaxmiji sang the Mangal-Geetam when my mother Smt. 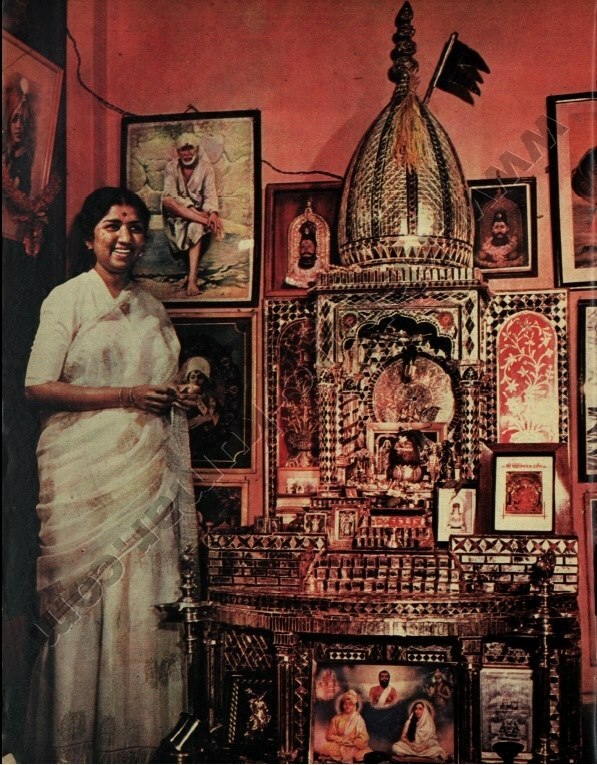 Susheela Narendra Sharma entered as a newly married bride and Sri Amritlal Nagarji’s wife Pratibhaji made Susheela stand on huge brass platter, filled with Kumkum filled water and she stepped like a Laxmi entering a home. Suraiyaji, the famous songstress, also sang songs to welcome the Bride! Other Guests in Baraat were famous Cine – stars like Sri Ashok Kumar, Dilip Kumar, music director Sri Anil Biswas, Bansuree vadak Sri Panna Lal Ghosh, director brothers Sri Chetan Anand & Vijay Anand , the famous Chhayawadi poet Sri Sumitra Nandan Pantji , Sri Ramananda Sagar ji , Urdu poet Safdar ” Aah ” sahab abd many other from Bombay Talkies and Hindi literary & film circle. Art fraternity, was also represented in large number as my mother Susheela was a Fine Arts graduate from Haldenker ‘s Institute . Their wedding card had an Easel shaped like a Lotus Leaf and a pen was inserted in the middle in form of a brush! A Saint Poet in the tradition of our Bhakt Kavi Tulsi, Narsimh Mehta & Tukaram , poet Narendra Sharma remained young at heart till his last breath. He understood the changing social scene and the changing modern mind. Thus, he and Mr. Pai were first to introduce Ramayan and Mahabharat via Indrajaal comic strip for children. Singer Late Shri Mukesh ji recorded Ram Charit Manas under his supervision for HMV. Among many other private albums penned by Pt. Sharma are Prem Bhakti Mukti and Ram Shyam Gun Gaan. The inaugural song for 1982 ASIAD Games atNew Delhi, ‘Swagatam Shubh Swagatam’; the inaugural song for Vividh Bharti composed by Pandit Ravi Shankar; ‘Nach Re Mayura’ composed by Anil Biswas and sung by Manna Dey; two of legendry Subrahmaniyam Bharti’s poems ,’Swasti ~ Shri’ & ‘Jaynaad’ and Kannada poet Shivruddrappa’s poem ‘Purush sukta’ in Hindi as ‘Nav Bharat Purush’; ‘Surdas A Minstrel of Shri Krishna’; Tagore’s poem ‘Shei din dujone’ transformed as ‘Nain Deewaane, ik nahin maane , kare man maani maane na ‘ in Suraiya’s lilting sweet voice; and Marathee Kavi Shri Tambe’s poem in Hindi emerged as ‘ Madhu mang na mere madhur meet’ sung by Shri Sudhir Phadke for Doordarshan in a LIVE telecast from Mumbai are among the many of Pt. Sharma’s gems that glitter on. Nineteen books of poems like the most famous Prawasee Ke Geetm (Songs of a Traveler), Hans – Mala, (Garland of Swan), Rakt – chandan ( on Gandhiji ), Agni – Shasya (Child of Fire), Kadlee – Van, Draupadi , Uttar Jai, Bahut Raat Gaye etc. and short stories like Arti ki Thali, Kadvi Mithee Baatein, and innumerable radio plays, essays, film songs, dance ballets (for Sachin Shankar : Mermaid & Fishermen), etc. have been compiled in the 16 volume Pandit Narendra Sharma’s Sampoorna Rachnawali. No. Of Poets Worked As Lyricists In Hindi Cinmea Like Pradeep, Sarawati Kumar ‘Deepak’, Bharat Vyas, Shailendra, Neeraj & Many More, From Which Pandit Narendra Sharma Ji Is The Name, Who Gained A Lot Of Popularoty & Respect Because Of Using His Poetry In Film Songs Very Effectively & Beautifully. In A Long Career Of About 44 Years For HFM (Hamaari Baat-1943 to Jalwa-1986), His Contribution Is Extraordinary, Because Of His High Class Literary Creations Like ‘Main Unki Ban Jaaun Re-HAMAARI BAAT-43’, ‘Saanjh Ki Bela Panchhi Akela-JWAAR BHAATA-44’, ‘Ab Raat Andheri Hai Aur Door Kinaara Hai-MERA SUHAAG-47’, ‘Charan Tumhaare Phool Hamaare, Hum Baalak Tum Paalanhaare & Bhaj Re Madhur Madhur Naam-NARSINGH AVTAAR-49’, ‘Surya Kiran Khel Rahi Hai, Khel Rahi Hai Aangan Mein-SATI AHILYA-49’, ‘Basanti Phool Khiley Patjhad Ke Gaye Din Beet & Rangeen Gagan Peechhe Chhota Anuraag Aur Armaano Ka-UDHAAR-49’, ‘Man Mor Hua Matwaala, Nain Deewaane Ik Nahin Maane & Preet Ka Naata Jodne Waale-AFSAR-50’. The List Of Such Songs Is Very Long, In Brief Songs In Films ‘Saagar, Nand Kishore, Maalti Maadhav-1951’, ‘Aandhiyaan-1952’, ‘Mahaatma Kabir, Raadha Krishan-1954’, ‘Sajni-1956’, ‘Bhaabhi Ki Chudiyaan-1961’, ‘Phir Bhi, Maaya Bazaar-1971’, ‘Satyam Shivam Sundaram-1978’, ‘Prem Rog, Subah-1982’, Penned By Pandit Ji Are Unforgettable, Immortal Melodies. 1944 – Chaara Aankhein, Jwaar Bhaata. 1947 – Jail Yaatra, Matwaala Shaayar Ramjoshi, Meera, Mera Suhaag, Pul. 1948 – Adaalat, Banwaasi, Bichhde Baalam, Mandir, Sant Tukaram, Veena. 1949 – Anyaay, Narsingh Avtaar, Sant Jannabai, Sati Ahilya, Uddhaar. 1950 – Afsar, Shree Krishan Darshan. 1951 – Badi Bahu, Deepak, Ishwar Bhakti, Maalti Maadhav, Nand Kishore, Saagar. 1953-jivan jyoti (2 songs were written by him, A Wedding song [ which Sahir sahab requsted Director / Producer Mahesh Kaul to ask him to write ] heard it on Amin Sayani sahab’s interview with narendra sharma answering this small detail. 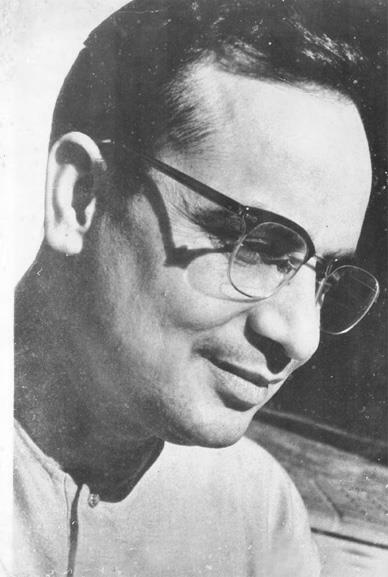 1954 – Mahaatma Kabir, Raadhe Krsihan. 1955 – Inaam, Joru Ka Bhaai, Ratnaghar. 1959 – Gokul Ka Chor. (Anyaay-1949 Was The Film Made On Production House BOMBAY TALKIES & Was Having Song From ‘Hamaari Baat-1943’ Song – ‘Main Unki Ban Jaaun Re’ As It Is & Meera-1947 Was Having Translated To Hindi Meera Bhajans By Pandit Ji).